^ Born in 1886 and died in 1943 after suffering from Dracunculiasis at Wewak. ^ Tanaka 1980, p. ii. 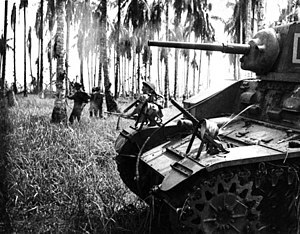 ^ New Guinea: The US Army Campaigns of World War II. 8,500 prior to January 1943, 24,000 between January 1943 and April 1944, and 9,500 from April 1944 to the end of the war. Retrieved 23 July 2015. ^ "Statistical and accounting branch office of the adjutant general p. 94"
^ Fenton, Damien (1 June 2004). How many died? (QnA) Australian War Memorial. ^ Stevens, The Naval Campaigns for New Guinea paragraph 30 Retrieved 10 March 2016.